A month or two ago I was contacted by Michael Alan Fitzgerald in regards to being at guest at this year’s Zombie Con in Liverpool, NY. After discussing particulars I agreed and then started to get things into motion. This would be the first time I would be at a convention at a table by myself-and I’ve only been to a handful previously-so I’m still a newbie per se to the convention scene. I basically wanted to replicate as close as I could the set up NoSS director Jonathan Straiton had at Monster-Mania in NJ back in March. I kinda got there 🙂 The TV I got (unfortunately not 1080 HD) is built in a way so when the stand is screwed on, the TV leans forward (?). I cheaply fixed that but it’s still kind of strange. I also got the same banner with my face on it that Jonathan had, but didn’t notice then or now (until someone pointed it out) that the quote on top of it could have used a spellcheck (“Goss” instead of “Gross”) 🙂 Then again, maybe it was like that due to space constraints. -I arrived and was glad to see that I got a table next to an outlet. MAD ANGEL FILMS was to be at the table next to me, but they were filming on “Radiant Dark” at the Sterling Renaissance Faire (Mark J. Peek was also a guest but his table was elsewhere so MAF was represented) so that table was taken by THE PROFESSIONALLY UNPROFESSIONAL NERDCRAFTERS. As you can see from the pic, it’s kind of funny to see our two tables next to each other :). I had six movies to sell for this one (hopefully more at future cons)-NIGHT OF SOMETHING STRANGE, SHE KILLS, Empire State of the Dead, TALES OF DRACULA, Locked In and (thanks to Greta Volkova) Bataille de Sang. Maybe next time I will have some pics as well. -I also was granted the opportunity to be interviewed by the G33KPOD Podcast for about 30 minutes-which really brought out the cornball 🙂 Of course, I talked too much and switched topics but hey-that’s me! 🙂 That should be out within a day or so online as well as on iTunes. -Another cool memory was having my image as Dracula sketched out-at the event-by Artist Brian R. Labelle. I found out when I was posting a pic on Instagram and saw that I was tagged in it-and yes, I had it by days end. 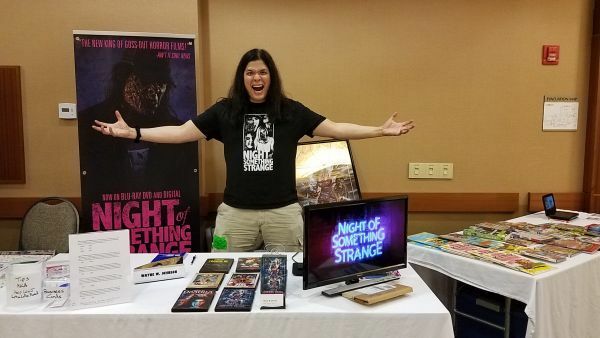 -Overall I had a great time and manage to sell a good number of DVDs-the main ones being Night of Something Strange and She Kills. Thanks to everyone who came by and said hi and it was great seeing old friends and making new ones. Thanks again to both Teddy and Michael for having me here and look forward to future conventions with you guys. -Pics from this can be seen on my acting page on Facebook. This entry was posted in ACTING, CONVENTIONS and tagged acting, Azriel Mordecai, Bataille de Sang, Brian R. Labelle, CAROLINE BLUE, cny, CONVENTIONS, dracula, Draven, Empire State Of The Dead, G33kpod, Great Volkova, Holiday Inn, horror, horror conventions, Jeremy Ambler, jonathan straiton, liverpool, Locked In, mad angel films, mark j peek, Michael Alan Fitzgerald, Monster Mania Convention, night of something strange, NY, Podcast, Professionally Unprofessional Nerdcrafters, Radiant Dark, SHE KILLS, sterling renaissance festival, tales of dracula, Teddy C. Hanes, The Walking Dead, wayne w johnson, WWJ, Zombie con. Bookmark the permalink. 4/20/2019 - Meme created by Chazs Miester based on a meme I posted that had Bruce Lee punching Thanos :D What a face-when the hell did I make that? :D Thanks!